Aizawl, May 9 : A large number of villages in Mizoram have become inaccessible after landslides, triggered by heavy and incessant pre-monsoon rains that have been lashing the state since Saturday, have blocked the roads, official sources said on Wednesday. 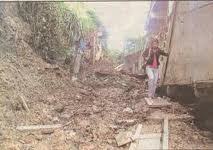 The landslides blocked the Champai road in Saiha district which connects the capital town with the Mizoram-Myanmar border. Kolasib district was the worst hit with 100 houses damaged and four injured. Power supply was disrupted in many places due to lightning and damage to electric cables, while broadband internet services and mobile services were constantly disrupted. Some newspapers were off the streets due to frequent power cuts in Aizawl city, while Mamit district was without power since Monday.